Aristolochia grandiflora, the pelican flower, is a deciduous vine with one of the world’s largest flowers that emits an odor that smells like rotting meat, attracting flies. Aristolochia grandiflora produces large solitary flowers from cordiate leaf axils. Leaves can be up to 25 cm (9.8 in) wide. Flowers are heart shaped: 10–20 cm (3.9–7.9 in) wide and have tails that are up to 60 cm (24 in). The flower is green/white with purple/brown veins. 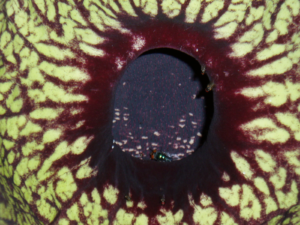 The center of the flower is darker colored, which attracts pollinators along with a distinctive odor to its reproductive elements. The flower has three sections, utricle, tube and limb, characteristic to all Aristolochiaceae. The use of this plant poses a risk as it contains the toxin aristolochic acid which is carcinogenic. The USDA has banned all products containing this compound. A. grandiflora contains many different alkaloids(bisbenzylisoquinolinic and 8-benzylberberinic) which aid in chemical defenses against insects and plant microbes. Chemicals in the essential oils include α-phellandrene and linalool from the stems and roots; germacrene D and γ-elemene from the leaves; and trans-nerolidol and geraniol from the stem and flower. 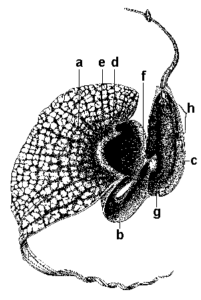 Other species of Aristolochia are also called “pelican flowers”; e.g. Aristolochia gigantea (giant pelican flower) and Aristolochia nana (tiny pelican flower). Trujillo, C. G.; A. N. Sersic (25 July 2005). 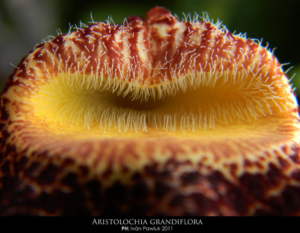 “Floral biology of Aristolochia argentina (Aristolochiaceae)”. Flora. 2001: 374–382. Heinrich, M; Chan, J; Wanke, S; Neinhuis, C; Simmonds, MS (Aug 17, 2009). 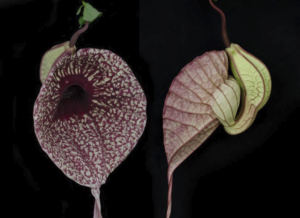 “Local uses of Aristolochia species and content of nephrotoxic aristolochic acid 1 and 2–a global assessment based on bibliographic sources.”. Journal of Ethnopharmacology. 125 (1): 108–44. PMID 19505558. doi:10.1016/j.jep.2009.05.028. Holzbach, Juliana C.; Lopes, Lucia M. X. (21 December 2010). “Aristolactams and Alkamides of Aristolochia gigantea”. Molecules. 15 (12): 9462–9472. doi:10.3390/molecules15129462. Maiti, M.; G. S. Kumar (27 September 2007). “Molecular aspects on the interaction of protoberberine, benzophenanthridine, and aristolochia group of alkaloids with nucleic acid structures and biological perspectives”. Medicinal Research Reviews. 27 (5): 649–95. PMID 16894530. doi:10.1002/med.20087.